Jeffrey Schrier assembles massive sculptural works configured as shimmering winged forms that are installed in museums, institutions and public spaces. The works utilize 11 million can tabs collected from all fifty states and eight countries by the middle school in Mahomet Illinois, amassed to recognize the number of lives destroyed in the Holocaust. Millions of tabs Schrier additionally acquired numerically reference lives cut short by continuing acts of inhumanity. 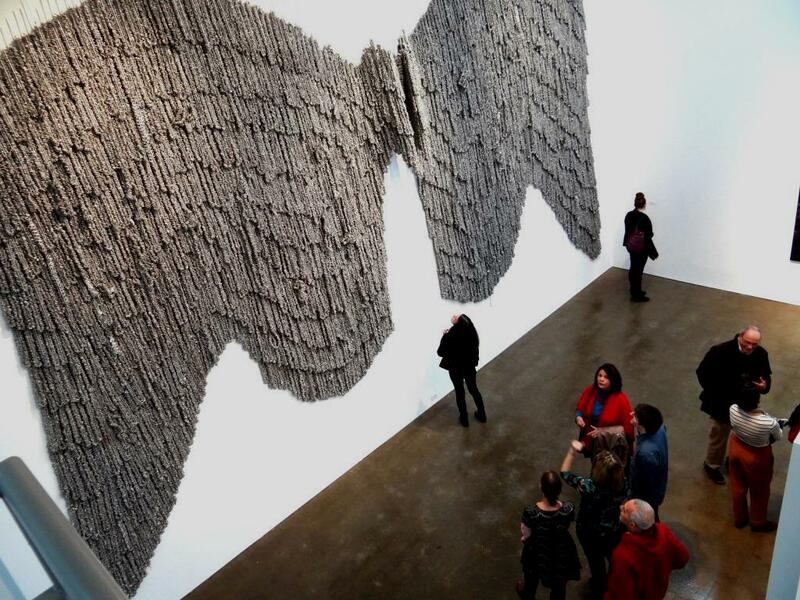 Through Schrier's programs, over sixty-thousand participants have constructed can tab elements, feather-like structures that Schrier uses as the "clay-like" sculptural material for his immense assemblage works, expressions of hope developing out of tragedy. 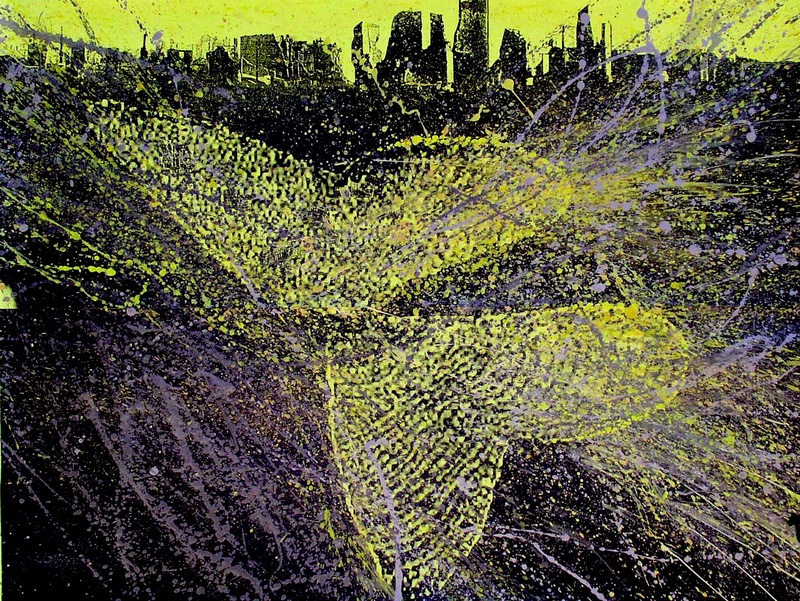 Painted montage monoprint 35" X46"
Exhibited through June 30, 2017, HUC-JIR Museum, NYC, in Paint by Numbers. 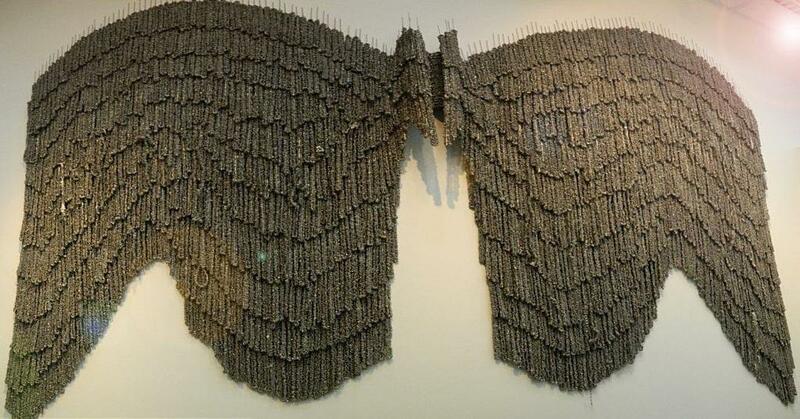 Schrier generated the work above from an aerial photo of WINGS OF WITNESS installation containing 6 million can tabs, 100 feet wide, 4.5 tons at the Holocaust Memorial and Educational Center of Nassau County, Welwyn Preserve, Glen Cove, NY. The montage includes images of the destroyed Warsaw Ghetto May, 1943.